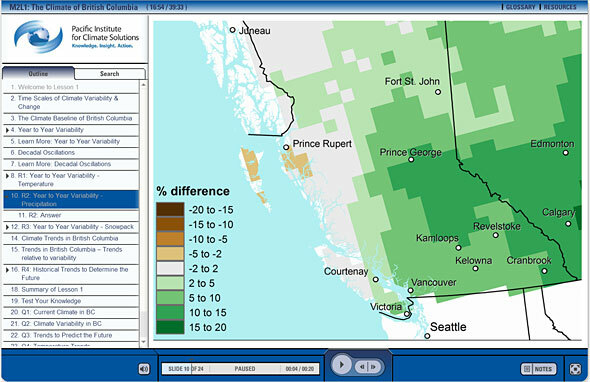 Example of the Climate Insights 101 interface and content. Climate Insights 101 is a set of three courses that provide a comprehensive introduction to the foundations of climate science, climate projections and impacts, as well as adaptation opportunities and the tools and initiatives available for mitigation. The courses are comprised of three-to-four sets of lessons apiece and concentrate on three areas: climate science basics, BC impacts and adaptation, and mitigation. These courses were developed by the Pacific Institute for Climate Solutions, working with PCIC scientists. Begin exploring Climate Insights 101.